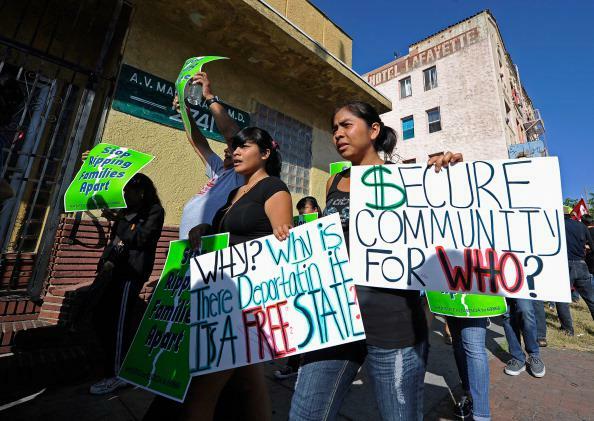 Immigrant deportation study: Crime rates not reduced by Secure Communities, research says. A protest against the Secure Communities program in 2011. A study of Secure Communities—a Bush- and Obama-administration effort under which local police share arrested individuals’ fingerprints with the Department of Homeland Security, which can then deport immigrant suspects who are undocumented or have criminal records—has found that the program does not lower crime rates, the New York Times reports. They concluded that there was no “empirical evidence” that Secure Communities caused “a meaningful reduction” in the rates of serious crime. How is this possible, given that 29 percent of the deportees studied had in fact committed “at least one aggravated felony or of at least two felonies punishable by more than a year in prison”? The study’s authors suggest the answer might have to do with the rest of the deportees, many of whom committed only immigration-related crimes or no crimes at all. If the total group of deportees is no more or less law-abiding than other residents of the communities they’re deported out of, it would follow logically that crime rates would ultimately be unaffected. More to come on this subject, hopefully.